Axl Rose is suing Activision Blizzard Inc, the owner of the hit video game Guitar Hero, RadarOnline.com has exclusively learned. Axl is suing the company for over $20 million dollars for fraud, breach of contract and unjust enrichment, among others claims. In the court filing, Rose sates that he is the majority owner of the trademarks and licensing associated with the band. Axl has an issue with Guitar Hero III using "Welcome to the Jungle" without his permission. 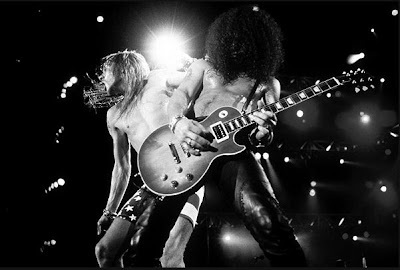 "Activision breached the contract when it released GH III which prominently features Slash imagery in direct connection with the use of "Welcome to the Jungle," exploits the prior association between Slash and Guns N' Roses, promotes Slash's and VR's (Velvet Revolver) separate interests and includes VR tracks as available downloads, all of which was and is directly contrary to the contractual obligations of Defendants." "In order to promote Guns N' Roses, Rose diligently attempts to channel fan and media attention to the current status of the band, including its current lineup, and focus on the band's current endeavors and plans for the future." "Rose and Guns N' Roses pursue a forward-looking outlook rather than one that dwells on the past." "Nonetheless members of the tabloid media have tended to focus on and mythologize a rift within the band that occured in 1996, when one of the bands guitarist, Saul Hudson, aka "Slash" and Guns N' Roses parted ways." "A preoccupation on the part of some members of the media with the rift between Slash and Guns N' Roses has led to a distorted public perception between the images and careers of Slash and Guns N' Roses." "Despite the fact that Slash has had nothing to do with Guns N' Roses' ongoing popularity and success since 1996." "(Slash's) association with the band lingers, at least as far as certain members of the media are concerned." "Riley sought to reassure Rose, through his representative Beta Lebeis, that in no uncertain terms, if given the authorisation to use Welcome to the Jungle in GH III, no VR related material would be included and no Slash imagery would be used at all, let alone in association with Guns N' Roses and 'Welcome to the Jungle.'" "In numerous conversations occuring in May of 2007, Riley reassured and represented that none of the rumours Rose was reading on the internet regarding the planned use of Slash and VR in GH III were true. For example, in one conversation Riley flatly denied the rumours stating "'Come on Beta, you know you can't believe everything you read on the internet.'" "While the form and substance of these conversations may have occasionally varied the central message and operative language used did not. Riley 'guaranteed' that provided Rose agreed to approve Activision's use of 'Welcome to the Jungle,' there would be no use of 'Welcome to the Jungle' and no VR in GH III." Rose is seeking at least $20 million dollars in damages, punitive damages and other associated costs.